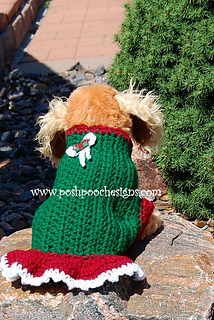 This pattern is a basic Dog Sweater with chest and sleeves, and a cute ruffle skirt. 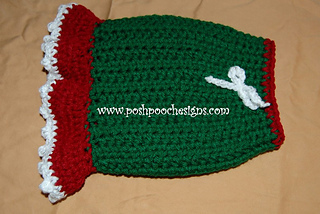 I Chose to use Sparkle Yarns of green red and White, But any Worsted Weight Yarn will work. There are no fancy stitches all basic Crochet Stitches. 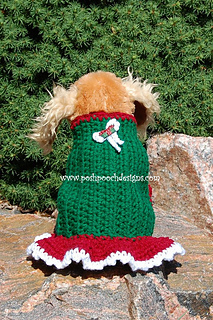 Crochet Pattern- Christmas Sweater Dress with ruffle for small dogs 2-20 lbs. 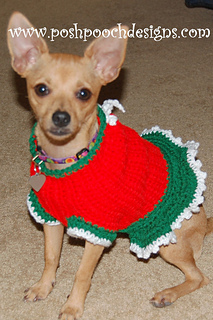 Pattern has full chest and sleeves, and a cute ruffle on the bottom hem.. Has instructions for how to size it to fit your dog.